The industry standard GIA colour range runs from D to Z, with D being colourless and Z displaying a noticeable yellow tint. Beyond that is what is known as fancy colour diamonds and are often blue, pink, green, brown and yellow. A diamond in this range with fancy vivid colour will attract a significant price premium for its rarity. D, E and F diamonds are grouped together as ‘Colourless', and the differences between them are not easily noticeable to the untrained eye. 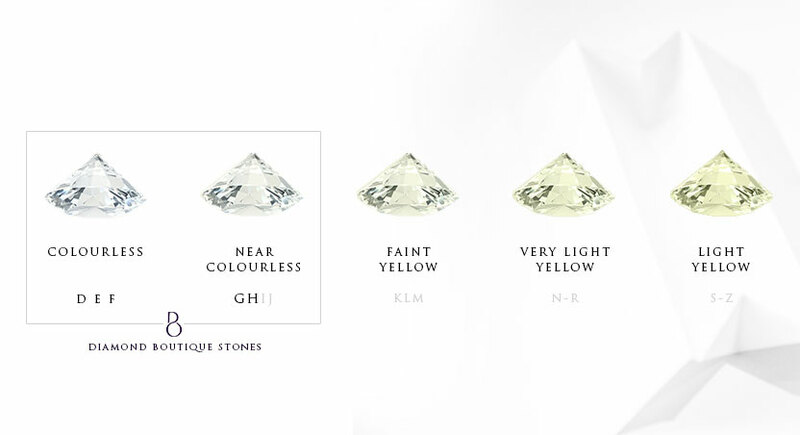 The next range of colour is G, H, I & J, known as ‘Near Colourless’ however when comparing a diamond of G-H colour against a diamond of I-J colour, traces of yellow colour are more noticeable in I and J and therefore not carried by Diamond Boutique. At Diamond Boutique we use H colour diamonds as standard rising to D.